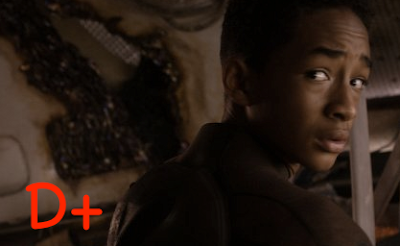 With Will Smith in the background and young Jaden Smith now taking the lead, After Earth takes place 1,000 years in the future when an alien race has taken over, one that can literally smell your fear through pheromone secretions. This strange race of a fiercely predatorily nature sets in motion a biological evolution on earth, rendering it uninhabitable to humans. When Captain “Cypher Raige” (Will Smith) and his son “Kitai Raige” (Jaden Smith) are forced to make an emergency landing on their once-beloved home world, only father and son are the survivors. With the ship broken into pieces and his father disabled, it becomes Kitai’s job to keep them alive by retrieving a honing device that can bring a rescue party to their location. But the device is far away and the trip toward it a hostile one. It is a revisit of the commonly laid-out theme of the demanding “Be a man!” father versus the emotionally vulnerable son who hasn’t yet found his way—of course, with a big break-thru on the horizon as the two must meet in the middle as they grow as human beings. It’s a familiar but more than workable schematic…or it would have been if it had worked. 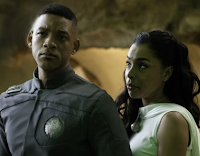 Slipping in and out of a techno-nerd’s fascination with gadgets, super suits, and planetary science specs, After Earth is more concerned with taking plenty of time to develop its struggling father-son relationship, which it does in a slow-build and tiresome manner that makes it feel longer than it is. And few will consider the melodramatic beat-down worth the time. We could be a lot more forgiving if someone knew how to credibly convey human emotion, but no one does. Jaden Smith’s performance, unlike his other respectable performances in The Karate Kid (2010) and The Day The Earth Stood Still (2008), is way overdone and, in fact, unlivable as he portrays a skittish, confidence-lacking kid who has yet to reach his potential. None of the characters grow on us or touch any of our sensitivities. And as we never end up caring for anything or anyone - with the plot itself constructed in such a way that makes it seem not particularly appealing or probable - we finish out with a feeling of gross dissatisfaction. 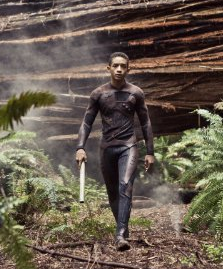 Sad to say, After Earth is another largely unpleasant exercise in facing the fact that M. Night Shyamalan’s once promising career has taken an irreparable thrashing.